These Empty Streets is a short drama released in 2011. Storyline : While on the lookout for her missing son, Susie (Libby Tanner) has an intimate encounter with his friend. It seems very difficult to see the whole movie, it has only been released in various international festival. However you can find a trailer on Vimeo and some pics below. If you can find the whole movie please contact me ! 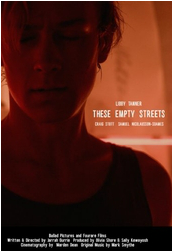 These Empty Streets Trailer from Jarrah Gurrie on Vimeo.